Ribbon cutting at 2pm to celebrate the new and repaired woodland paths. There’ll be tea and home baking, the chance to hear about the plans for managing the woodland in the future, and den-building and other activities for the children. Come along to the Community Woodland entrance behind Forest Drive. All welcome! The contractors did a speedy job on the woodland paths and finished within the week. The path surfaces have been repaired, worn-out bridges replaced with new culverts, boggy areas drained and a new path created to avoid the steep gradient at the southwestern corner of the woodland. The Brownie bench now faces into the woodland to give a good view for weary walkers. It looks great and we hope that the improvements will make the woodland much more accessible for everyone – pushchairs and wheelchair users included. … BUT, after being repaired less than a week there is already dog dirt on the paths. Please, dog owners, pick up after your dog – dog poo carries disease which can cause blindness in humans and is horrible to walk on. Picking up the mess is your responsibility, not your dog’s. Thank you! BVT would like to thank the Ward Discretionary Fund, Paths for All and Scotmid whose financial support funded the path improvements. Our funders would like to hear what you think about the path improvements so please send in your comments. 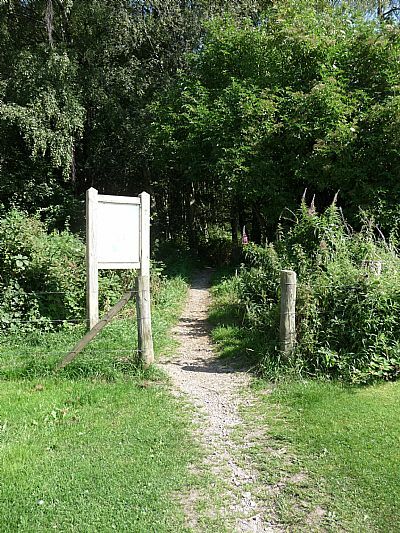 There will be a community event in the woodland in August to mark the completion of the path work – keep an eye out for details. 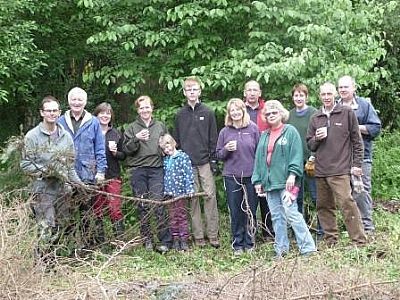 The volunteers did a great job in the woodland at the weekend. 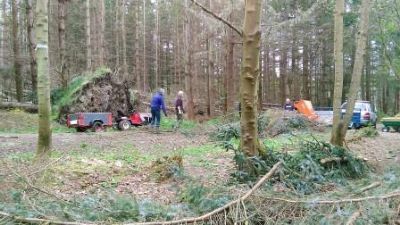 Thank you to all who helped saw, lop, drag brash, operate the machine, take down trees, spread the chippings, bake, take photos and many other tasks. A quick tally of people and hours gives 16 helpers on Saturday, 9 on Sunday and a total of 98.5 hours of work. Well done! April 2016: Exciting times for the woodland. Thinning of Sitka continues to let more light in and, thanks to the Ward Discretionary grant, work will start soon to improve the paths. No more muddy boots! 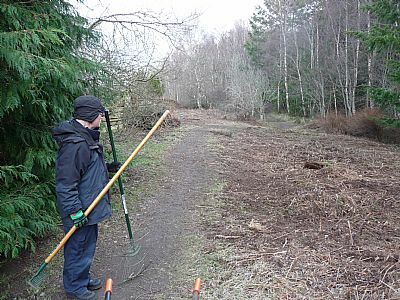 We are planning a working weekend for 7/8 May to process the brash from the recent felling and clear some of the bushes and garden plants that have taken hold as ground cover, smothering the native flowers and reducing biodiversity. 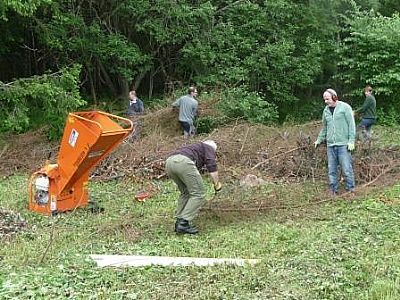 June 2015: There was amazing support for both days of the work party to drag brash to the cleared area behind the Forestry Cottages and process using the chipper. It was really hot and sweaty work - a huge thank you to the 16 people who helped over the two days and to Rachel for her much appreciated baking. We processed and raked out all the brash from the previous tree felling, leaving the area ready for planting in the autumn. Regular strimming will be needed to control the nettles and bracken but this will now be a much easier task. Hard at work ...and a well-earned break! May 2015: Great turnout at the Paths survey and design course. There has been another round of tree felling to let more light in and make space for realignment of the path on the west side of the woodland. 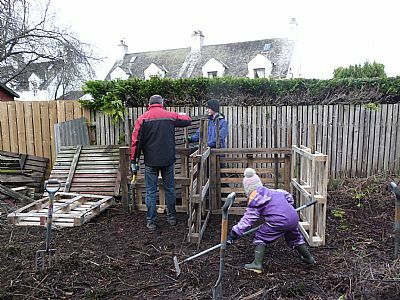 February 2015: BVT is now clearing the nettles, rosebay willowherb and bracken from the north side of the woodland behind the forestry cottages into compost bins to allow the bulbs and wild flowers to flourish. The ground will be kept clear of the rogue weeds and trees such as hawthorn, crab apple, rowan, blackthorn, gooseberry, blackcurrant and holly will be planted. This is an ongoing project - if you would like to help please email b.v.t@btinternet.com or phone Susan Williams on 01463 790282. 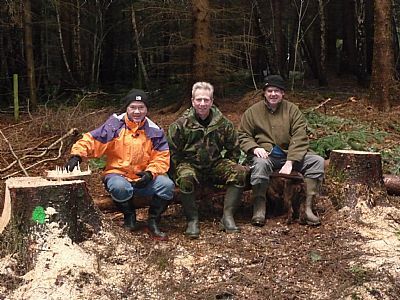 January 2015: Following the felling of trees on the east side of the woodland, a working group tidied up the clearing and the new seating area. The next phase of felling will take place in February or March. Once the structural work of tree thinning is completed, improvements will be made to the paths throughout the woodland. February 2014: Users of the Community Woodland may have noticed that some trees have been identified by orange biodegradeable paint. This is part of the Management Plan that is currently under development, with the marked trees being recommended to be removed as part of the thinning process. No trees will be removed until Balloch Village Trust and Balloch Community Council accept the Plan and agree on thinning of specific trees.